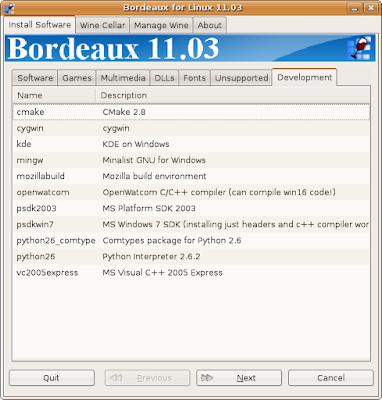 The upcoming Bordeaux for Linux and BSD 2011.03 release will see a major shift in how the program is written and the new features that will be available to current and future Bordeaux customers. 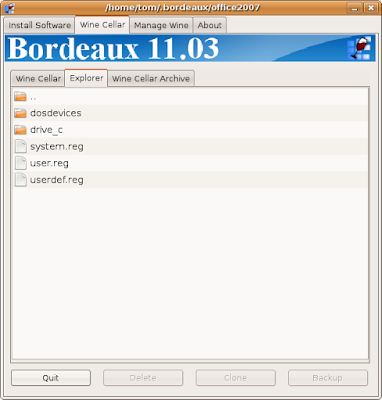 This is a brief introduction to explain some of the many planned features that will be available in the upcoming Bordeaux 2011.03 release. 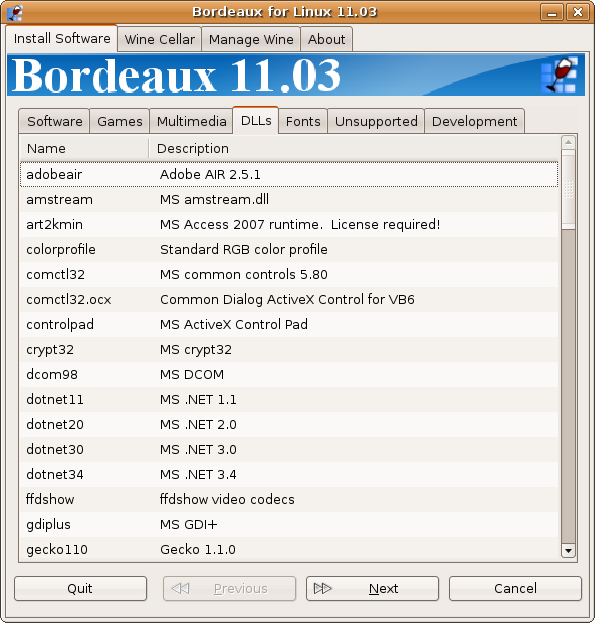 The first major change is the Bordeaux 2011.03 GUI has been rewritten from scratch in Gambas, and requires the Gambas 2.15.2 runtime libraries or higher to be installed to function correctly. 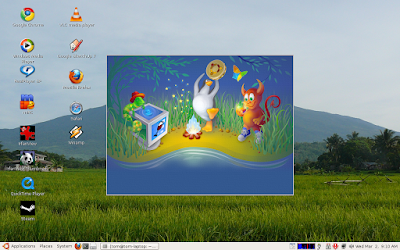 You can easily install Gambas in Linux from Synaptic or Yum or by going to the Gambas site and downloading a binary or the source code. 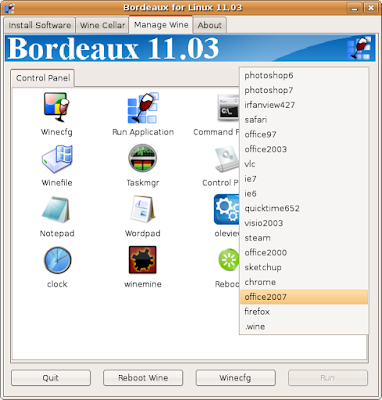 Gambas for FreeBSD and PC-BSD can be installed through a ports install. If you have PC-BSD you will need to install ports if you haven't already done so. We now have 45 Games and Benchmarks that can be easily installed via Bordeaux. 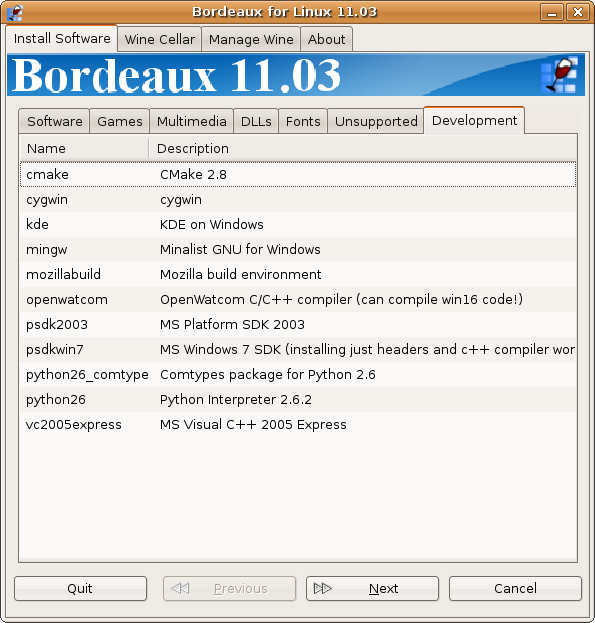 Cellars e.g wineprefixes can now be easily made from a GUI Cellar maker. Winetricks has been split up into categories, so its easier to find what you want quickly. You can now explore a Cellar with the built in Explorer. In the future we will add the ability to run a application or game directly from the explorer. We now have a built in update manager, updates will be simple and easy. 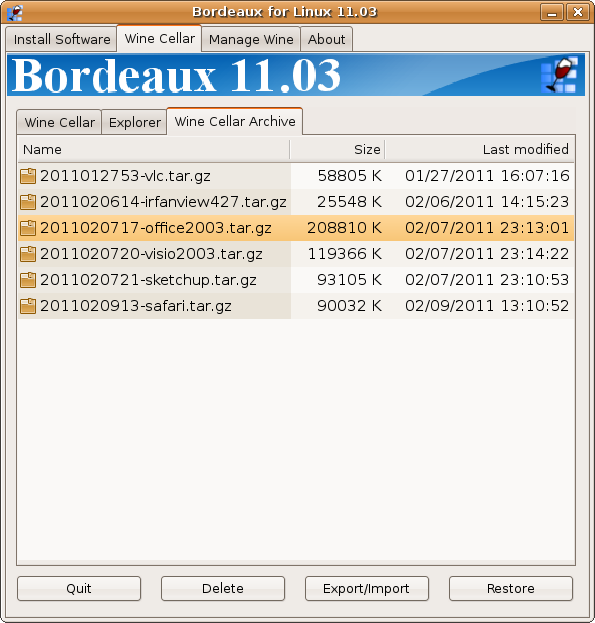 You can now delete, backup, import and export Cellars to different machines with ease. Or just backup and restore on your stand alone computer. Unsupported applications can be easily installed and configured. 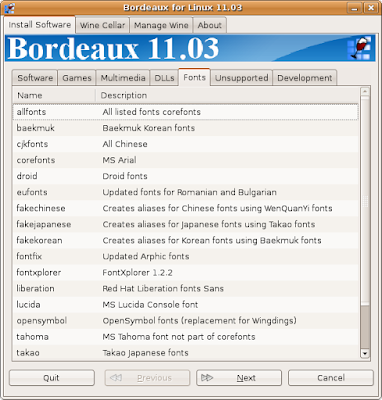 This introduction is just a overview of the many options Bordeaux 2011.03 and beyond will have, one area not covered here is the planned font configuration options that we are currently working on. Pricing for Bordeaux 2011.03 will remain the same at only $20.00 per license. At this time Bordeaux is on sale for 50% off and this sale will end when we ship the upcoming 2011.03 release. 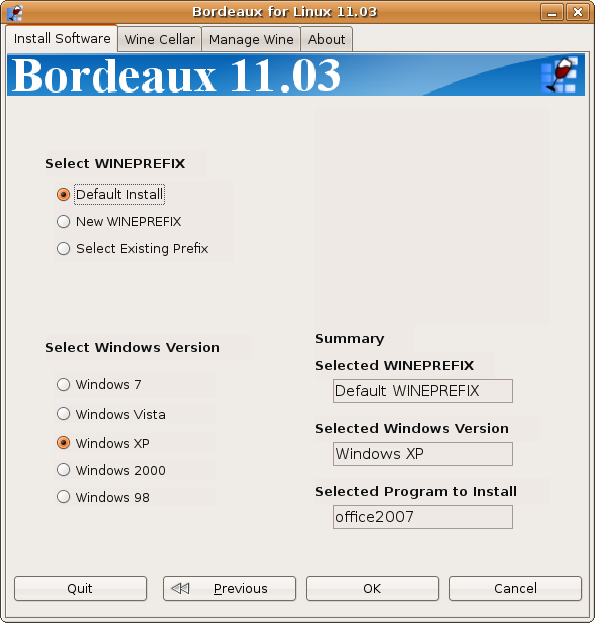 So if you want to get Bordeaux while its still on sale and upgrade to 2011.03 once it has been released this is the best time to do it. Also, keep in mind you get six months of upgrades with your purchase. 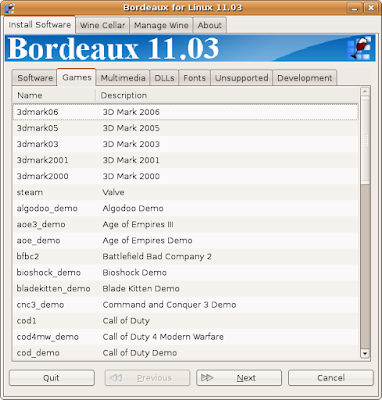 This is the new Bordeaux Splash Screen that shows when you first start Bordeaux. After you select the application you want to install and then next you are taken to the setup page. where you can select the default install or even modify the install if you wish. Next is the Games Tab where we have benchmarks and Games with default installs, you can also modify the default install and make changes if you wish. At this time we have 45 Games and Benchmarks listed and plan to add more in the future. 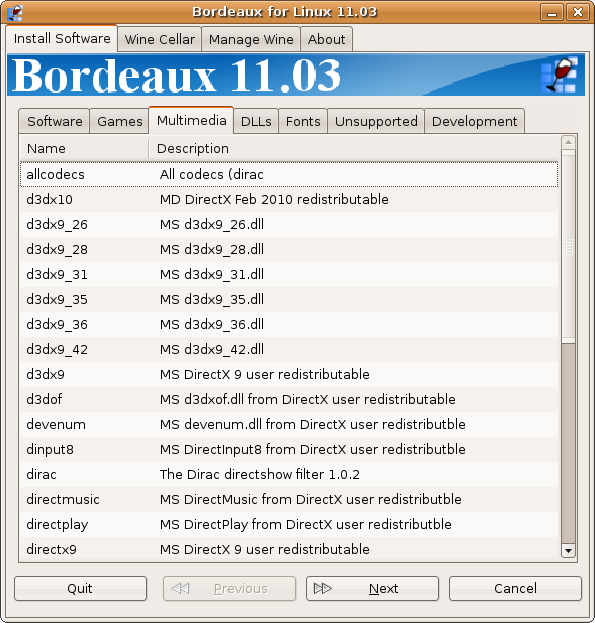 In the Multimedia Tab you can install Multimedia components like video codecs and Microsoft DirectX into a Cellar. In the Dlls Tab we have a large range of Microsoft Dlls that can be installed into a Cellar as well as color profiles. In the Fonts Tab you can install a large range of Windows fonts into a Cellar. 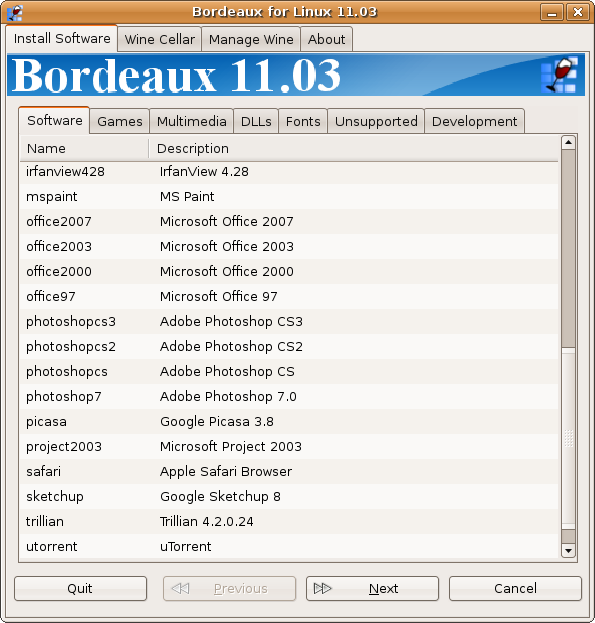 In the Development Tab we have Microsoft Windows Development tools that can be installed into a default Cellar or a Cellar of your choice. It is now drop dead simple to install unsupported applications or games in Wine with Bordeaux. 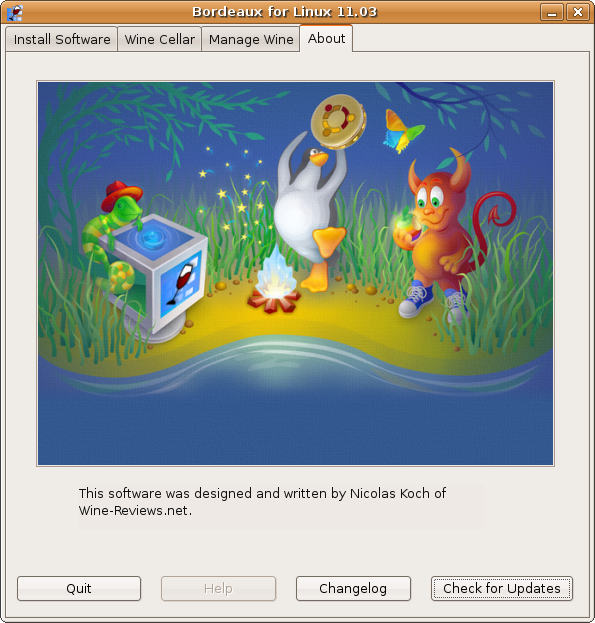 You can install components into a cellar and then install the application or game into that same cellar. 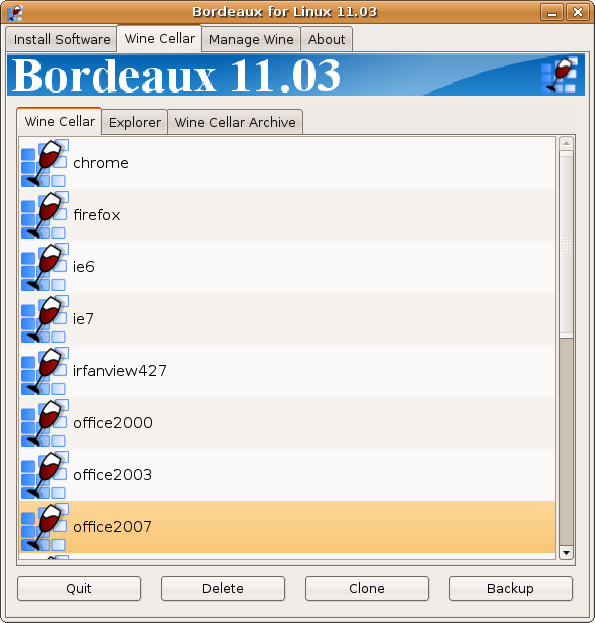 Select the Windows version, and name the cellar to your liking. 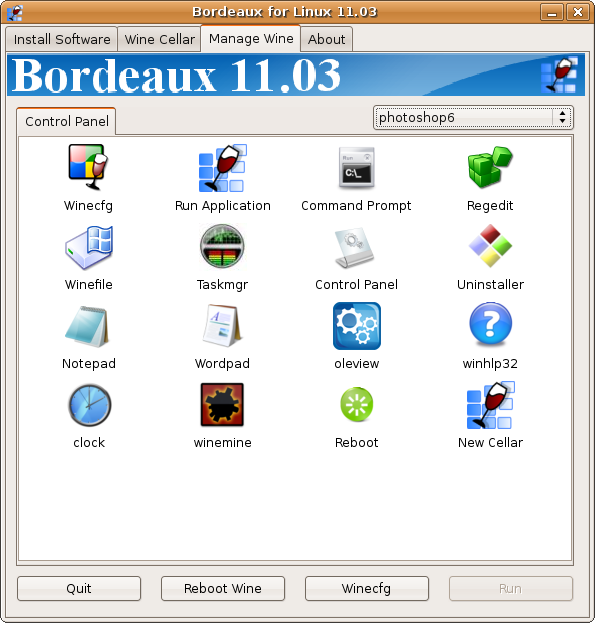 After your Application or Game is installed just go to the Manage Wine Tab and you can easily make additional changes via regedit or winecfg. 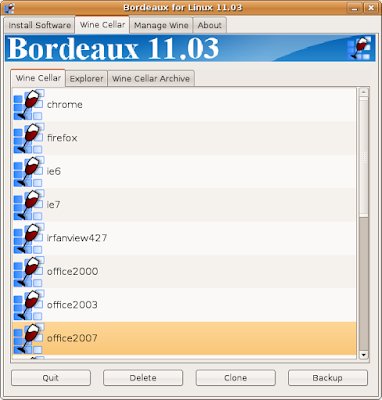 After you install some of the supported applications or games you can select the top Wine Cellar tab and then view the cellar. 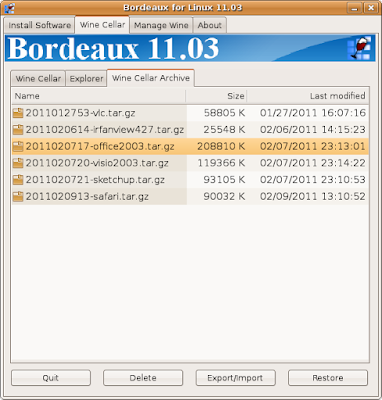 From here you can delete, clone or backup a Cellar. You can go to the Explorer tab and explore a cellar's contents. just double click on the Cellar you wish to explore. 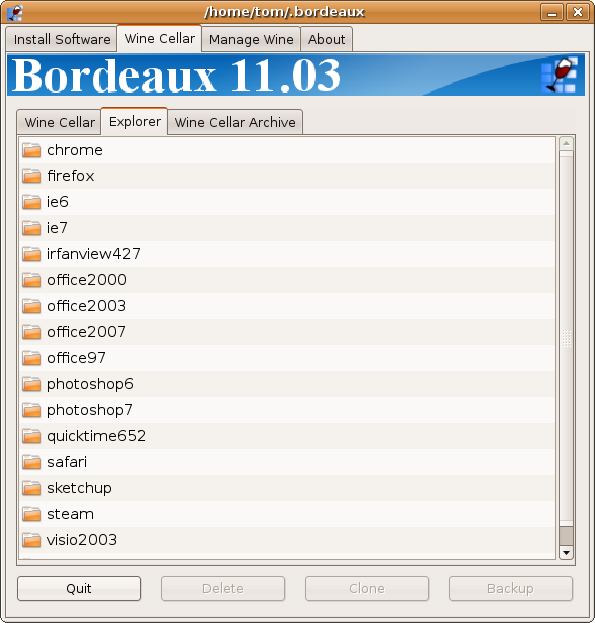 You can also clone or backup a cellar, and then export it to another PC or restore it at a later date. Import copies the backup to the backup folder import + restore imports backup and restores to a cellar. Export allows you to save/download and move backups elsewhere. The manage Wine tab list all the builtin Wine tools so you can modify a Cellar to your liking, run regedit and tweak the registry settings, or winecfg and set the most common settings. 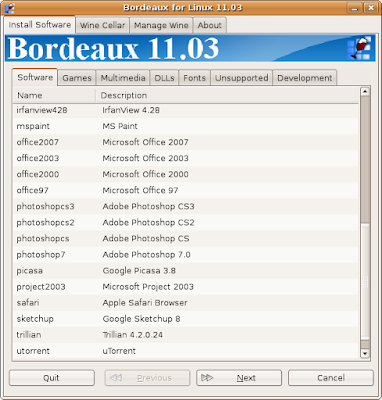 You can run any of the builtin tools or games from the cellar of your choice, just select the Cellar from the drop down menu. 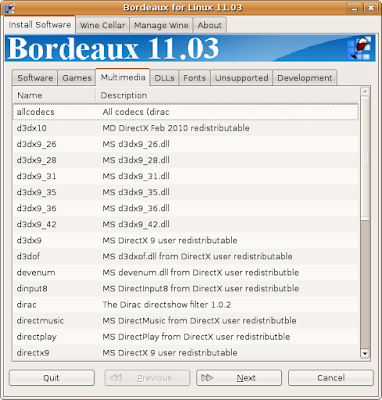 Here is a screenshot of the drop down menu and the programs that I currently have installed with Bordeaux 2011.03 at this time. This is a screenshot of the About tab, where you can see a full changelog or check for updates. 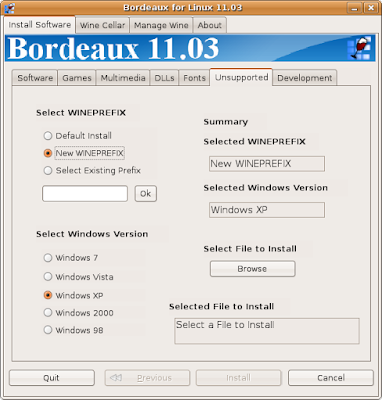 When your ready to exit Bordeaux you can do a full exit or keep Bordeaux in the system tray for easy access. 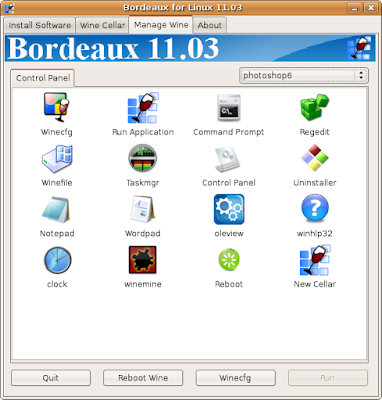 If you choose the system tray, just click the Bordeaux icon and Bordeaux will be ready for use instantly. 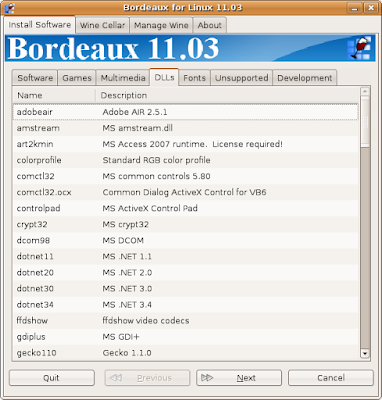 Please keep in mind this is just a brief overview of Bordeaux 2011.03 and more features are planned for this release and future releases. If you would like to support this release please consider making a purchase or donation today. That splashscreen looks kind of similar to old VirtualBox graphic.